I failed... My name is Ryder Carter, future heir of Realm Five, Minato. I was destined to do great things, to walk alongside my fellow star knights, as we desperately searched for the woman who would lead our galaxy to salvation. My spirit and I had failed her once, unable to prevent the chain of events and challenges she’d faced for sixteen cycles. Then, we finally found her - alive. Within two rotations, she'd blossomed into a beautiful rose - such delicate petals, filled with purity and life. My mission was to guide her home, to where she truly belonged, as our Princess and saviour from the approaching darkness. She was more than just our Princess; I loved her with all my heart. But...I failed. My once perfect rose, damaged by my failures. Would she ever forgive me, her star knight who'd sworn to protect her? Will I ever get the chance to tell her how much she means to me...to us? Only the Starlight gods can tell. Please...bring my Firefly home. 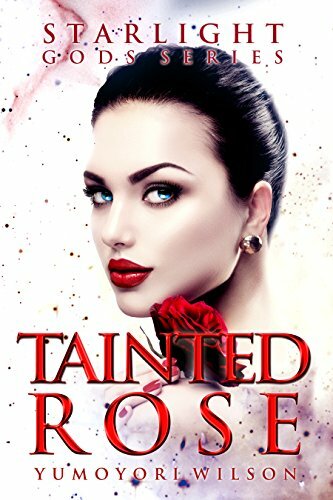 ~In Stars We Trust~ Tainted Rose is Book Two in the new, paranormal reverse harem series. Recommended for 18+ audience, containing mature sexual content and strong language. Mako had finally escaped the owner and the horrible tortures she faced everyday. The guys were trying to help her acclimate to the regular world while waiting on a response from her family. Then tragedy struck again when the owner showed back up in her life, this time destroying everything. Mako is left in darkness while the guys are holding on by a thread. So book one left us in a pretty dark and desolate place. We didn't know what had really happened or if anyone had survived. Book two picks up just a tad bit later. It still takes a little reading to find out exactly what happened. We spend a lot of time in Ryder's head in this book but we do get a good look into all the characters. And I do mean ALL the characters. The spirits like to have a voice too. They are all dealing with and trying to recover from what happened. We finally get to meet Kai in this book. For spending the least amount of time with Mako, he seems to understand her a lot and her reasons for being upset with some of the group. So we obviously have some issues to work out. As Mako discovers more about herself, more problems seem to arise with some of the knights. While the first book was more centered on Mako escaping the owner and him coming after her, this book focuses more on getting to know all the characters and building relationships and trust. We get to learn a lot about everyone's pasts and what has led them to where they are now. That's not to say there aren't outside forces still causing problems. This book also leaves us on a pretty big cliffhanger but not quite as big as the first book. This was a long book and at some points was a little hard to follow but overall it was a great read. I really enjoyed learning more about everyone and seeing first hand how they felt. Looking forward to the next one so I can know what happens next. Oh and can I just say how gorgeous is that cover?? Be sure to follow Yumoyori on FB here and join her FB group here.